The chart at the top shows only the Columbus Crew. In gray is the individual players current guaranteed salary. In dark blue, is true value based on my player rating model. With my (still evolving) player ratings I've had the bug to match them up with player salaries in a way that makes sense in a way that might make Billy Beane happy. Using the statistics available I've attempted to assign a score to each player. It's impossible to really go beyond maybe a letter grade or descriptions like; Great, Good, Average, Poor, Disaster - but I'm fairly satisfied with what I've got. Sébastien Le Toux is probably not the best player in the league. He is, however, one of the best. I'm confident in this because no matter how I play with the numbers he always finds his way into the top 10%. Why? He is on one of the best teams, their GA average is great, he has a handful of assists, one penalty and he plays loads of minutes. I weight each category with a multiplier and HEEEYOOOHHH out comes a usable aggregate. In Le Toux's case: 88.50. The best in the league. Each player has a score like that. Players can actually receive an negative aggregate because of weighted GA. Shavar Thomas for Sporting KC has the lowest number at -38.84. I slide the difference between these two and out comes my score on a 100 pt. scale (on right). So, looking at it this way, where does this leave the Columbus Crew to this point in the season? Well, let's get to that. - $49,290,780.79 is the total salaries off all those players (using a rounded cap number of 350,000 for the DP's). Less then Fernando Torres transfer this past season. On my sliding scale (to get rid of negatives) Le Toux has 127.34 points. Use my per point factor of 24022.1 per point and that gives him a value of $261,282.60. His actual salary is $179,000.00 making him a value. 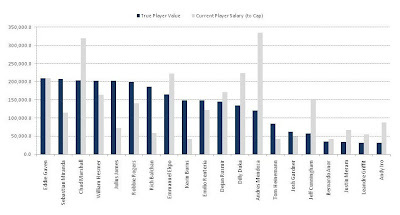 In the chart for the Crew we have 10 players performing at or above their current salary. Of course a players worth is not only in performance, as the case with team captain Chad Marshall. 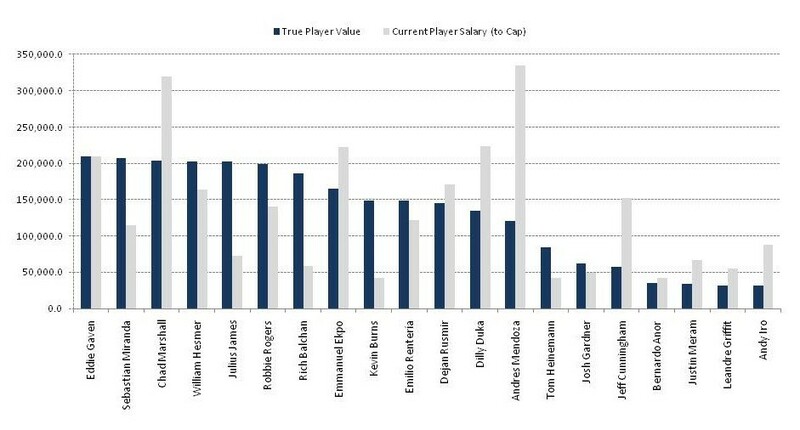 And of course the player market dictates how much a player is paid. Overall, the soccer market in the US is small so we don't see a whole lot of wasted spending by many (if any) teams (yet). Major League Soccer is going about this the right way. Moneyball-ing it, so to speak.